Among the writings that you’ll find helpful are his Way of the Cross, Visits to the Blessed Sacrament, The Moral Theology and The Glories of Mary. Perfection is founded entirely on the love of God: “Charity is the bond of perfection”; and perfect love of God means the complete union of our will with God’s: “The principal effect of love is so to unite the wills of those who love each other as to make them will the same things.” It follows then, that the more one unites his will with the divine will, the greater will be his love of God. Mortification, meditation, receiving Holy Communion, acts of fraternal charity are all certainly pleasing to God — but only when they are in accordance with his will. When they do not accord with God’s will, he not only finds no pleasure in them, but he even rejects them utterly and punishes them. 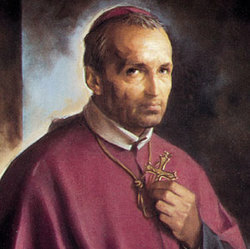 O God, Who did inflame blessed Alphonsus Your confessor and Bishop with a burning zeal for the salvation of souls and through him did enrich Your Church with new offspring; grant we beseech You, that imbued with his wholesome precepts and strengthened by his example, we may come happily unto You.